Selling your home might feel like a rush to the finish line. The market is hot right now, you think—so you should hurry up while you can still get a good price. Or perhaps your dream home was just listed, but you can’t move in until your current place sells … so you should expedite this, right? The problem is, if you move too fast, buyers see right through the fact that you skipped important home renovations. And this, my friends, might end up costing you time and money. Lots of both, in fact. So take the time to sell your home right. These six home improvements will make your home sell faster and for more cash. And some of them aren’t even very much work. This is one of the easiest—and cheapest—tricks in the book: Good landscaping can add up to 28% to overall home value. Why pass up free money? 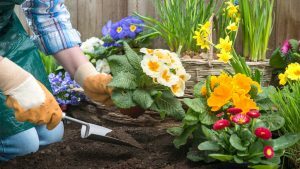 Hire a landscaper to give your front yard the once-over, or just clean up the details yourself (e.g., edge the lawn, plant flowers), and update the outdoor furniture on the front porch to give the space a fresh, “buy me now” appeal. But if you don’t have time for a full overhaul of your front yard, small changes can still have big impact. “At least replace your welcome mat with a new one and paint or restain your front door,” says Kary J. Bartmasser, a Realtor and broker in Beverly Hills, CA. Still rocking that old-school carpeting? Get rid of it, like, yesterday. Right now, carpeting isn’t just an aesthetic choice—it’s a choice that can actively turn away buyers who can’t see beyond it. Instead of noticing what a wonderful, light-filled living room you have, they can think only about just how much money it will cost to get rid of that nasty old carpet. Do it yourself and save them the trouble. What you have underneath might be far more presentable, with a bit of cleaning and refurbishing. If it isn’t, a new floor is a worthwhile investment. Decided to keep your carpet? At the very least, make sure to clean it thoroughly before buyers come trekking through your home. You’re not just irritating buyers by refusing to fix broken windows and doors. Ignoring basic repair work might actually cast a pall on your entire home. “Buyers will suspect that other hidden items in the house haven’t been kept up either,” Aronsohn says. If any of your rooms are doused in a dark shade, such as eggplant or emerald, cover it up with a coat of light or neutral paint. Buyers find it easier to picture themselves living in a home with neutral walls—plus, they’ll make your home seem larger, cleaner, and far more appealing. If you still can’t bring yourself to paint over the hues you’ve so carefully selected, consider this: After living in a home for a few years you may become a bit blind to how your walls are showing to newcomers. If you’ve never sold a house before, you might be surprised by how bold buyers are. Digging through your drawers? Peeking inside your cabinets? How dare they! But buyers are expected to be little investigators—so be prepared before they start sleuthing. Buyers “should be able to see how much storage is available rather than the clutter you might have there,” says Will Johnson, a Realtor with the Sell and Stage Team in Hendersonville, TN. Also, check for any loose drawers, hardware, or shelving so buyers don’t wonder what else might be amiss. And hide those strange or semi-incriminating items that aren’t at all meant for public display. Before putting your home on the market, bring in a second set of eyes (your Realtor or stager is perfect for this) to look over your lighting. Is it dated? Does it serve the space poorly? Check out your favorite home improvement store for cheap, modern lighting that can make your home go from old news to new and stylish in no time. The ROI can be pretty darn impressive.